A heavy bune is a bulky, boxy warship with thick wooden-panelled sides to protect the ship and crew alike. Inside it carries a large number of boarding troops, some armed with bows to fire from the loopholes in the panels. The size and weight of the vessel can make it slow and unresponsive, but it is not built for speed. Instead, it serves as a floating platform in battle. Sailing in close to an enemy ship, the crew uses grappling hooks to lash the vessels together, and then the boarding party engage the enemy in hand-to-hand combat. During the Sengoku Jidai, large ships were common. 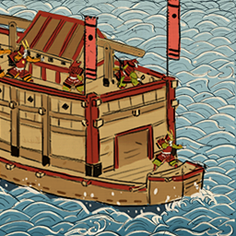 The ‘o ataka bune’ resembled a floating castle and carried armed samurai and ashigaru as well as sailors to man it. The Japanese did not rely on cannon to sink enemy ships, but would board and fight face-to-face as if they were on land. The o ataka bune was specifically built for this tactic and had a folding bridge section that opened so that troops could cross from one vessel to another. This way of fighting was in keeping with the samurai ideal of combat, where a warrior would seek out a worthy opponent and fight in single combat. Large crew, in particular melee troops.